When it comes to choose a university, there are many variables to factor in the process and City University satisfied all that I was looking for. I chose City because of its programme over the three years, its reputation – the Department of Psychology, with its research groups such as the Autism Research Group, the Human Memory Research Group and the Centre for Psychological Well-being and Neuroscience, is highly regarded and well-known in the UK and abroad. It is also known for the excellent lecturers and professors that teach in the undergraduate course. Moreover, the campus is in the heart of London, located in the ideal area close to King’s Cross and St Pancras stations, Angel tube station and near the Barbican Centre. Lectures are extremely engaging and stimulating, I loved that professors and lecturers pushed you beyond your comfort zone when it comes to think critically about current research topics in psychology and mental health. It was also interesting to be lectured by PhD students in their second and final academic year for it was a good opportunity to networking and sharing common interests with people who are closer to your age. The staff is composed of researchers, lecturers and professors who are experts in their own field and are passionate about their subjects. I enjoyed the wide and comprehensive range of modules included in the three-year programme. I enjoyed connecting with new students from all over the world for the international student community at City is indeed large. Be sure that the friendships that you make at City will last a lifetime. Every time I have been asked this question I struggle giving one single answer because I genuinely enjoyed all the modules throughout the three years. Statistics and Research Methods were very interesting and the knowledge that I have acquired with these two modules which run from the first to the second year is enormously helpful now that I am doing an MSc in Psychiatric Research. During the third year, students can choose their favourite modules. The ones that I selected and that were most appealing to me were “Abnormal and Clinical Psychology”, “Topics in Cognitive Neuroscience”, and “Psychological Illness, Brain Damage and Dreams”. All these modules together with “Biological Psychology” and “Personality and Differential Psychology” (both run over the 2nd year) were indeed the ones which I remembered vividly all the lectures and the key points. What I have learnt in those modules is very helpful at my current stage during my MSc at King’s College where the knowledge from these modules is helping me to understand better and to appreciate current mental health issues. It is very hard to answer but I believe that there have always been interesting lectures and events at City. One that I still remember is that every term the Department of Psychology would organize talks and presentations from experts from other universities both UK-based and from Europe which anyone could attend. I remember attending an interesting talk on Transcranial Magnetic Stimulation (TMS) in eating disorder (during the third year) and another one machine learning to understand cognitive processes (during the first year). Furthermore, as a psychology student at City, University of London you could do your final year project with electroencephalography (EEG), TMS, eye tracking devices exploring the field that you are most interested in. If students are interested or simply curious in any of these, they should discuss their research interests either with their tutors or with lecturers as, I am sure, they will find ways of involving them in their most current research. If you could give one piece of advice to a prospective City BSc Psychology student, what would it be? Do not be afraid of sharing your enthusiasm for this fascinating subject. It is going to be tough and challenging course but I would advise any student who is considering coming to City or is starting psychology to just give everything you have to this course and make the most out of every single lecture, workshop, lab class. You will never regret it! I graduated in July 2016 and I am currently an MSc Psychiatric Research student at King’s College London. I will be starting a clinical placement at the South London and Maudsley in the summer as Honorary Assistant Psychologist. I would like to do a Doctorate in Clinical Psychology after one year of working Assistant Psychologist in the London or in the UK. 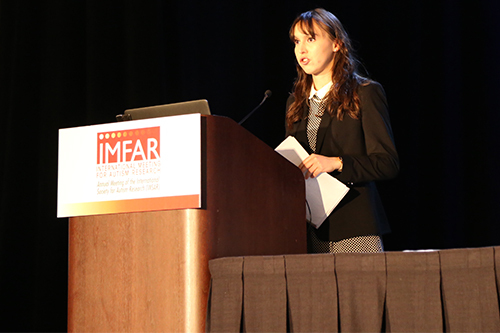 I am currently involved with the Autism Research Group at City, University of London in the study that was part of my undergraduate project which resulted in a conference presentation at the International Meeting for Autism Research (IMFAR) 2017 in San Francisco.